The Chabad Center of Sudbury invites young children and their families to join us for an enjoyable Pre Chanukah Story Hour. 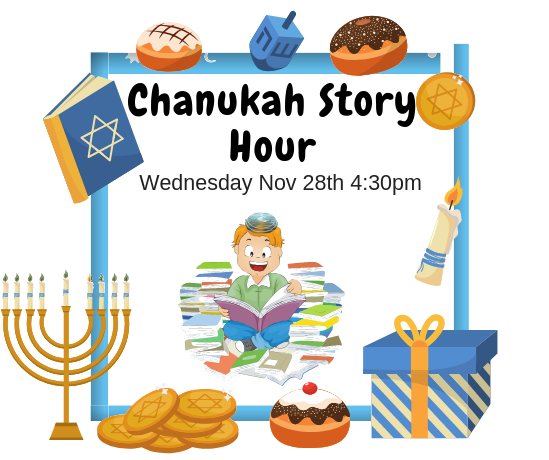 Enjoy some great stories from a huge Chanukah Story Book, Chanukah Fun, Refreshments and More. Please RSVP so that we can plan accordingly and feel free to invite your friends. This event like all other Chabad of Sudbury events is open to the community. Fee: $5 per child or donation of your choice to Chabad of Sudbury. The Story Hour will take place on Wednesday Nov 28th at 4:30pm at the Chabad Center of Sudbury, 100 Horse Pond Road, Sudbury, MA 01776.